Design and printing companies and 3D printing businesses use cutting-edge technology to unleash creativity. 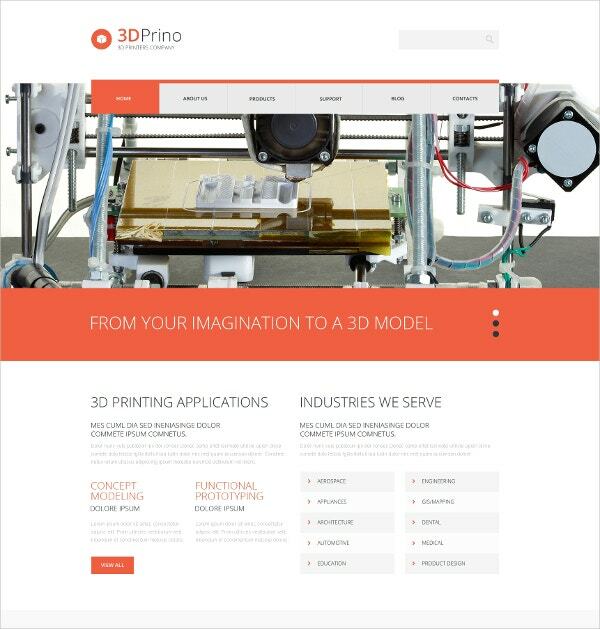 WordPress Website for printing businesses should also reflect the creative and modern nature of the 3D printing industry. Printing companies creating their website should ideally use Printing WordPress Themes that are specifically built to showcase high-resolution product photos and services offered. Choose themes that give you a free hand to change, customize, and edit layouts as necessary, but at their core are responsive, professional, and built on the best modern business website-building frameworks for WordPress. 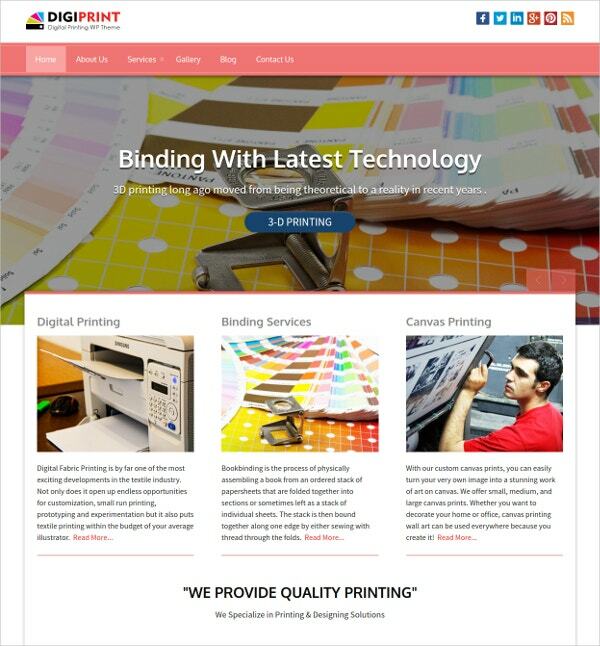 The Print Shop Responsive WordPress Theme is, as the name suggests, a responsive template that 3D printing shops can use to quickly build SEO ready, widget and slider-friendly websites. Features include easy 2-step installation, over 80 shortcodes, more than 600 Google Fonts to customize typography, multiple color options, a filterable portfolio and fully editable layout and custom post support. 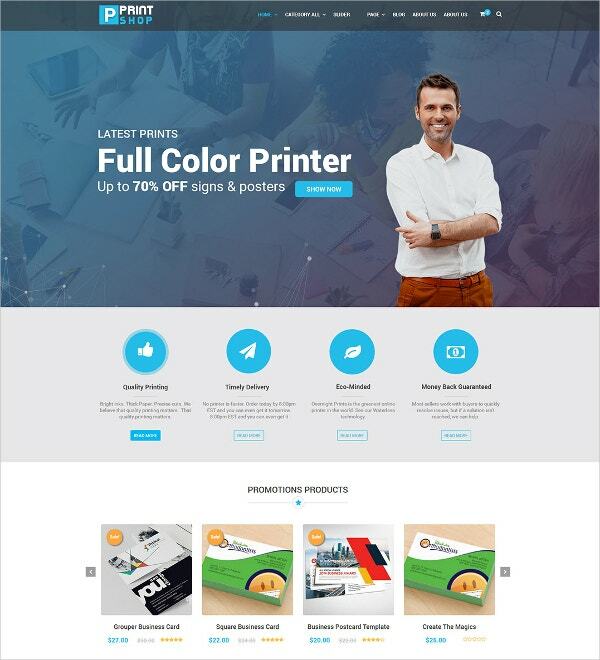 Printcard is a powerful creative theme for many kinds of small and medium online design and printing services. Features offered include the Revolution Slider plugin, the Max Mega Menu plugin, page templates, unlimited color variations, fully customizable product page with the visual SiteOrigin Page Builder, WooCommerce integration, and unlimited sidebar and more. You may also see Best WordPress Templates. 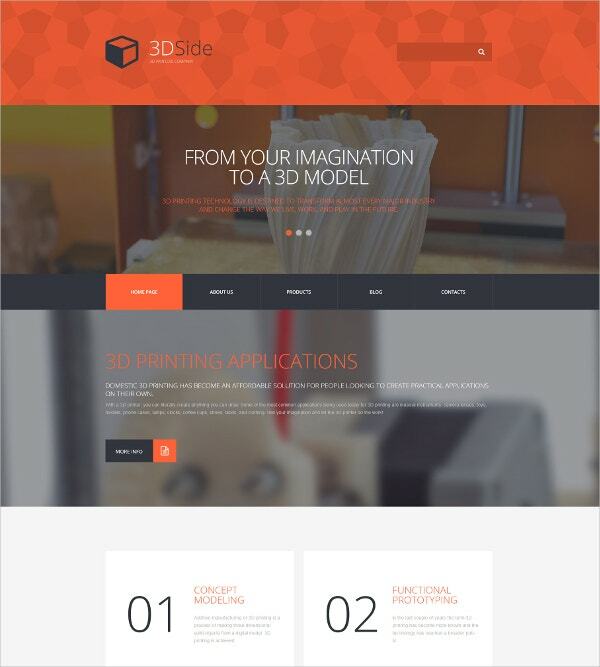 The 3D Side WordPress theme is a bold and beautiful, responsive and retina-ready template built on the Cherry Framework with Bootstrap 3.3x, and HTML plus JS and Parallax animation. Features include Sliced PSD, custom page templates, calendar, Google web fonts, Google map, Favicon, dropdown menu, social options, carousel/slider/accordion image galleries and more. The ThreeD WordPress theme is made for studios, architects, and design agencies. 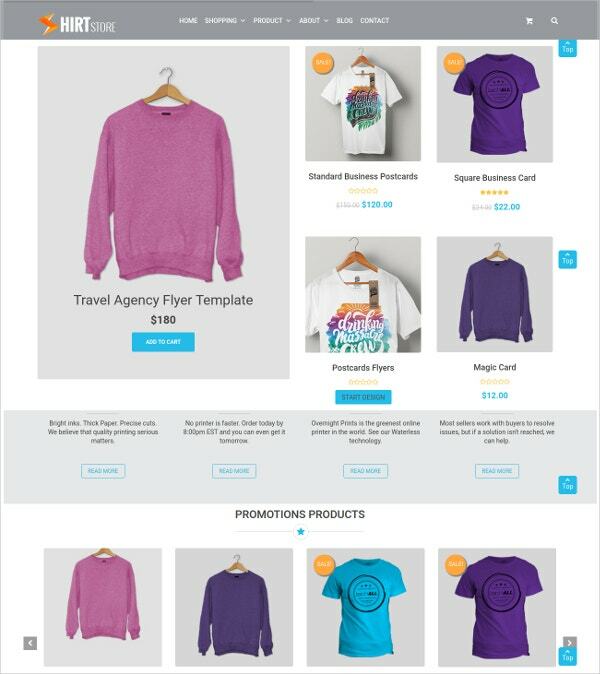 It is a vibrant, modern, retina-ready premium theme to showcase design work with the help of features like a single page and multi-page layouts, 3 unique demos, Visual Composer, Revolution Slider, WooCommerce, Redux, Contact Form 7, MailChimp plugin and more. 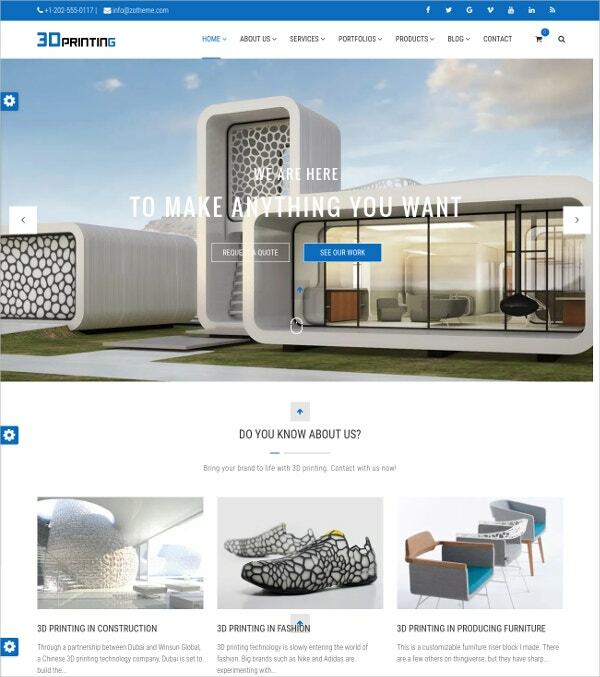 The fresh and vivid 3D Printing Technologies theme has been designed specifically for printers, offering features like the customary 2-step installation, multiple color themes, fully editable layouts etc. plus over 600 Google Fonts, filterable portfolio, custom widgets, Fantastic sliders. Special effects like the Parallax Effect and Lazy Load effect can add depth and interest to your website. Koncept is a dark, creative chic theme with a retina-ready and clean design printing companies will love. Features include 30 demo layouts and over 990 pages for various industries including printing, plugin support like WPML, unlimited skins and colors, Revolution Slider, WooCommerce, drag-and-drop Visual Composer, Redux admin panel, a multiple portfolio layout, one-click import of data and more. 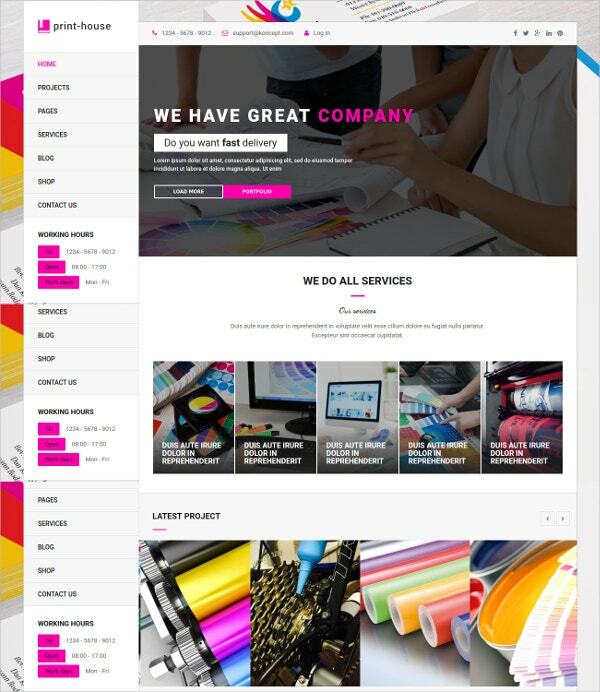 The WordPress Printshop Website template with online design package gives you order design and upload features to create full responsive web pages. Features include the popular Revolution Slider plugin, Max Mega Menu, Unlimited Sidebar, an integrated visual composer, WooCommer support, YITH WooCommerce wishlist feature for customers, multiple logo versions, full-screen image and video slider and more. 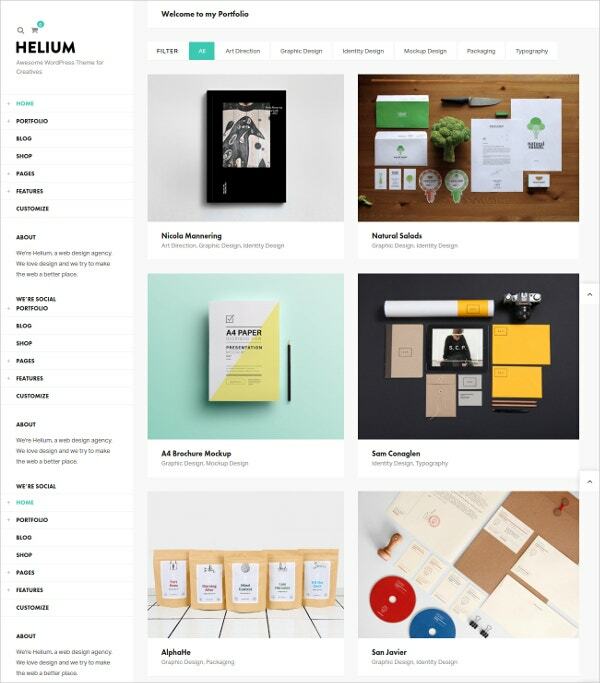 Helium is a portfolio and blog theme built on an AJAX system and gives you a clean space to showcase design works with plenty of white space. Features include the WordPress Live Customizer, over 600 Google fonts, easy digital downloads, widgets, WPML compatibility, advanced page builder, three portfolio layouts, blog post formats and more to help you build a responsive and retina-ready website. Digiprinting is a template ideally for printing book bindings, cards, canvas printing etc. It is a colorful, fuss-free and simple theme with modern features like a full-width slider, a powerful admin panel, custom styling options, social icons, business logo, video section, call button, social icons, multiple pages, a gallery, contact form, SEO, Custom CSS and several template skins. 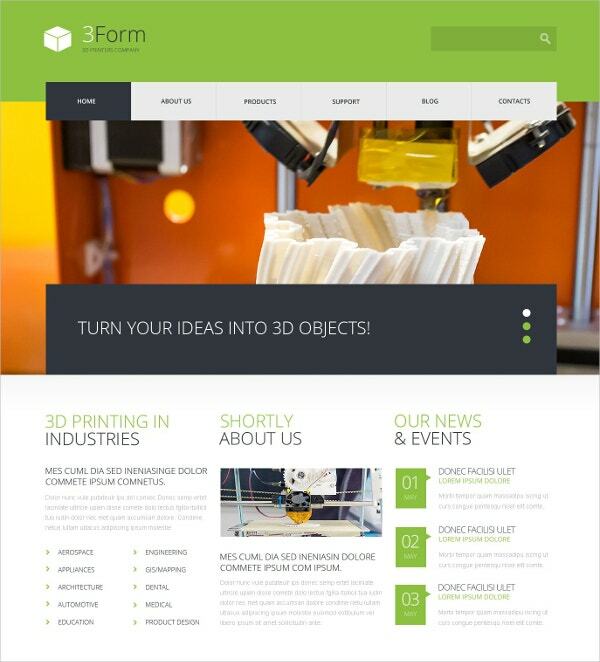 This 3D Printing theme is responsive and elegant in green and gray shades, with a wide and boxed design that suggests sophistication. Features include a Visual Composer, 4 homepage demos, 6 color presets, multiple inner page templates, Slider Revolution, CF7, speed optimized built on a Twitter Bootstrap supporting a long list of shortcodes and more. When building a website for your printing business, choose a WordPress template that welcomes viewers with dynamic elements making for faster website loading, easy navigation through showcase galleries, call to action buttons, and distraction-free, uncluttered layouts. Pick themes with eye-catching skins and colors that are easy to customize and reflect the aesthetics of your business. You can also see App Showcase WordPressTemplates.